Whoa! I fast-texted two ladies, Chit Juan and Sara Sasani. Chit had been to Iran to promote coffee culture while Sara, being half-Iranian, flies there regularly. “Oh, Tita! You will love it!” exclaimed Sara. I thought so. I should not let a biased media dragoon me out of this chance to experience it. But as on previous trips, I would remain security-conscious and not take any unnecessary risks. From Doha, Qatar, we landed in Shiraz, in a modest, nondescript airport. We were cleared by customs after standing in a line that was marked “For Foreigners Only” — all eight of us. Take note: Alcohol is strictly prohibited. Don’t bring any bottles, even as gifts or from Duty Free. We were met by our Iranian guide, Jahan Pahlavan, and another fine gentleman who was responsible for turning this journey into a dream come true, Umit Besiri, a major tour operator based in Turkey who also had close ties in Iran, being half-Iranian. True enough. The hotel in Shiraz (Parsian Hotel) has a no-star category with outdated facilities. Although the rooms were cleaned daily, there were many areas in need of a good, spanking housekeeping system, and training. • Hafez, the celebrated poet who exalted the joys of love, wine, also religious hypocrisy. He wrote in the form of ghazals (rhyming couplets with refrain), defined as a “poetic expression of both the pain of loss or separation and the beauty of love in spite of that pain.” Isn’t that simply romantic? His sarcophagus tomb was raised up on a dais surrounded by rose bushes, water channels and orange trees. One of his oft-quoted poems is the one I quoted above: “Last night, from the cypress branch, the nightingale sang.” To Hafez, the cypress symbolizes both a beloved and a regal presence while the nightingale evokes the traditional setting for human love. I was simply love-struck. No wonder his poetry has set hearts aflame for centuries without end. • Absolutely breathtaking was the Al Mulk Mosque (think milk for Mulk), also known as the Pink Mosque. From the outside, it didn’t look any different from the other grand mosques I’ve seen in Malaysia and in the Middle East, but once you step inside Al Mulk, you’re immediately transported to an optical wonderland. Stained glass panels and windows dance with natural light and reflect a myriad of shapes and forms, all incredibly stunning. My eyes went wild. I didn’t know where to look, where to stand, and what to capture. It was like entering into a kaleidoscope and the question remained: how could one seize and take hold of such beauty? I stood away from a window and stepped on the reflected plethora of colors on the carpet. Could it get any more fascinating? One traveler wrote, “Even if you are the world’s least religious person, you might feel your hands coming together in prayer when you see the brilliance of this light.” And what’s the crowning peak of Al Mulk? Look up — it’s the jaw-dropping ceilings! I was floored by the dizzying profusion of shades, hues, shapes and carvings. Yes: something spiritual happens. • In another tomb — Ali Ibn Hamza holy shrine, honoring a nephew of the 8th Shiite Imam — a lady met us by the door to distribute chadors to wear, not in black, but in floral printed cotton and freshly laundered, too. The complex also has a school for little children. Judging from the sound of their chatter and laughter, they were happy to meet new faces, as we all were. What was there to see? The interior. Walls, dome, ceiling, crevices, corners were studded with faceted cut glass shimmering like emeralds. Hamza’s tomb was encased in a gilded block. • The Ghavam House and Garden. The Ghavams were merchants and their house was a showroom for Iranian traditional art. Some rooms were clad in prism mirrors from top to bottom that — still not content — lined every space and crevice, too. It made me giddy. Wall panels, arches and windows also used gerehchini, the Iranian art of assembling pieces of wood, cut in geometrical patterns and then inlaid with colored glass. There were also ceilings made of bamboo-shaped wood and hand-painted with Victorian flowers and birds. Just imagine: art paintings not on canvas but on the full expanse of the ceiling. 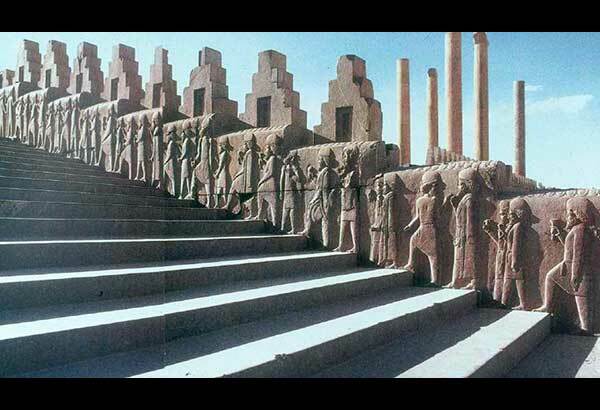 • The high point in Shiraz was Persepolis. It brought me back to our history class, beguiled by tales of mighty conquerors and their obsession to plunder and make mincemeat out of the enemy. Persepolis was built by King Darius the Great as a big ceremonial capital during the height of the Achaemenid Empire. The complex consisted of several palaces and structures covering massive grounds. At the entrance alone, the wide and expansive frontage already gave you an idea of how much grounds it covered. The most glorious palace in the complex was named Apadana (Audience Hall) and was used for the King of Kings’ official audiences. Who pillaged and destroyed Persepolis? Alexander the Great of Greece/Macedonia. He ransacked and looted the city. Picture a “crowd of mules and 3,000 dromedaries” carrying loads of treasure on their backs. Not only that, he was hostile to the local Persians and held games to celebrate his conquest “offering sacrifices to the gods, entertaining friends, and drinking madly.” The story was that a courtesan named Thãis from Athens threw a blazing torch at the Xerxes Palace, destroying in an instant what had been the pride of Persia while sounds of singing, flutes and pipes went on. The sacrilege committed by Persia’s King Xerxes in the Acropolis was avenged by a Greek courtesan. Walking the grounds of Persepolis, there were some stone relief that have, thankfully, been saved. Jahan told us that these stone carvings have many symbols. Take the Lion eating up the Bull. It means a change of season. The lion symbolizes spring while the bull is for winter; then there’s the Faravahar, symbol of Zoroastrianism, the state religion of ancient Iran, with a human face representing wisdom, and wings spread out with three feathers for good thoughts, words and deeds. Nowadays, Iranians wear the Faravahar as a piece of jewelry, a pendant, as a secular national symbol. There were more figures etched on walls and panels depicting the luxurious life in the palaces with conquered subjects paying nonstop tribute. The grand double-flight staircase with 110 steps each led up to the grand hall and was designed for two different types of callers: for the emissaries bearing loads of precious gifts and for royal guests wearing elaborate, floor-length garments “in purple and gold” who walked up the short steps for easy ascent. These 110 steps are senior-friendly. At the Tachara, a visitor’s hall, the stone walls were so finely and vigorously polished that they reflected images in the light, like mirrors; thus it’s called the Mirrors Hall. It also served as a museum for cuneiform, the writing system first used in ancient Persia. At the All Nations Gate, there were giant columns of palm trees, walls with giant bulls, winged bulls or lamassus and again, the Achaemenid cuneiform — all giving a grand account of the city’s wealth and influence. The elevated tomb of King Darius was also carved from the rock mountain surrounding Persepolis. The tomb that gave me goose bumps was that of King Cyrus who united the 12 tribes of Persia. He was mentioned in the Holy Bible as the only Persian ruler who was kind to the exiled Jews in Babylon. He allowed them to return to Israel. (He has an honored place in Judaism). When Alexander the Great found the tomb of King Cyrus, with the inscription, “Last place for peace, allow me,” Alexander didn’t destroy his tomb. Lucky for us. There’s a piece of biblical history preserved in Shiraz. • Qur’an Gate. Travelers passing underneath the gates were believed to receive the blessings of the Koran and will safely return home. Of course, we all took turns to walk past the gate. Manila Killa’s first EP “1993” was just released on the record label, Moving Castle. My husband loves to watch YouTube and these days I’ve been sitting watching with him.